Thank you for inviting me to speak at the Hotel Investment Conference for Central and Eastern Europe (HOTCO). I first came to Hungary in the late 1980s during a time of great political change. What I have witnessed has been dramatic. Hungary has managed to differentiate itself from its neighbours. I have often been called a visionary. I call it luck! But the fact is that I have invested in places where other people could see no value. I have a hunch and more often than not, I have been right to trust it. My biggest investment to date is Al Habtoor City, now located in the centre of Dubai, on the banks of the Dubai Water Canal. In 1979, when I built my first hotel on that plot, people made fun of me. Today, it is the heart of Dubai, with more than 20,000 people visiting at any one time. Al Habtoor City is not my only success in terms of location. Habtoor Grand Resort was the first in the Jumeirah Beach area. It is now one of many beautiful hotels in the vibrant Dubai Marina. We, at Al Habtoor Group, were the first company to buy a plot on Dubai’s wonder of the world, the Dubai Palm Island, now home to our Waldorf Astoria hotel. I am grateful for these successes. I have learned that success comes from God’s blessing, luck and good planning. When I first decided to invest in Hungary, a country very few Arabs had visited, and in the middle of the global economic crisis, everyone doubted my decision, even members of my management. However, the similarities between the UAE and Hungary were obvious to me. I could see what no one else could. They are both safe havens of the world, and have the potential for great returns. I started investing in this country since 2012 when I purchased my first hotel here… Le Méridien – which has now been rebranded as The Ritz-Carlton Budapest – the 1st Ritz-Carlton hotel in Hungary. The former Adria Palace has great potential, and I believed it was fitting for a superior brand such as the Ritz-Carlton, part of one of the biggest hotel chains in the world – Marriott International. I later purchased the InterContinental Hotel overlooking the Danube River, a great location boasting one of the best views across the city. and the Dorottya Udvar office Complex. ONE… the ease of doing business. The process is conducted in a simple and timely manner. TWO… Investments here are more rewarding than in any other parts of Europe, the US, and the so-called established investment destinations. I believe that the more mature markets in Europe have peaked. They yield very little returns - if any, AND the red tape is a major put-off to investors. Hungary is a beautiful country with a vibrant economy. It offers more incentives and subsidies to investors than the traditional markets in Europe and that gives Hungary the competitive edge over places like London, Paris, Frankfurt, and Berlin which have all become too lax as other ‘less mature markets’ have gained momentum. I applaud the Hungarian government. Hungary, like the rest of the world suffered hugely from the global economic crisis. But it has bounced back much quicker than a lot of places around the world and has proved its resilience thanks to good policies. Between 2015 and 2016, Hungary enjoyed one of the highest growth rates in the region. The government here understands the importance of foreign investment. It provides numerous tax benefits and other incentives to both local and foreign investors. Over the past few years the tourism sector in Hungary has picked up. The country now ranks high on the world stage as a safe tourism destination, and many international and regional routes pass through here. Since Hungary joined the European Union in 2004 tourism has been steadily on the rise. In 2015, Hungary ranked as Europe’s fastest-expanding tourist destination by the World Tourism Organization… growing by 20 per cent from the previous year. That year more than 11 million people visited Hungary, and 2016 saw that number rise further. Since I invested in Hungary, I tell my friends in the Arab world to do the same, and told friends all over the world to visit Budapest. Whenever I visit Hungary, I see many of their familiar faces on the streets. I encouraged Emirates Airline – one of the world’s top carriers – to start daily flights to Hungary. This has paved the way for more business between our countries, and benefited both the UAE and Hungary. It has a strong presence of foreign and international companies who opened offfices here in recent years. And it is politically stable. I believe that Hungary and some of the countries that border Hungary are the places to invest in… like Austria where I own the Imperial Hotel Vienna. Unfortunately, the rest of Europe is crippled with problems – politically, economically and socially… Not to mention the escalating migrant crisis which is going to take years or decades to resolve. On top of the already high unemployment and a long period of stagnation, this is having a profound impact on the Eurozone economies that are heavily reliant on tourism. Hungary is considered a safer destination by far than the troubled traditional markets who are dogged by political failure, and increased terrorism – which is resulting in dropping visitors numbers, as travellers look for alternative destinations. The relations between the UAE and Hungary are strong, and building by the day to the benefit of both our countries. As a result, more UAE citizens are visiting Hungary than ever before – and vice versa. 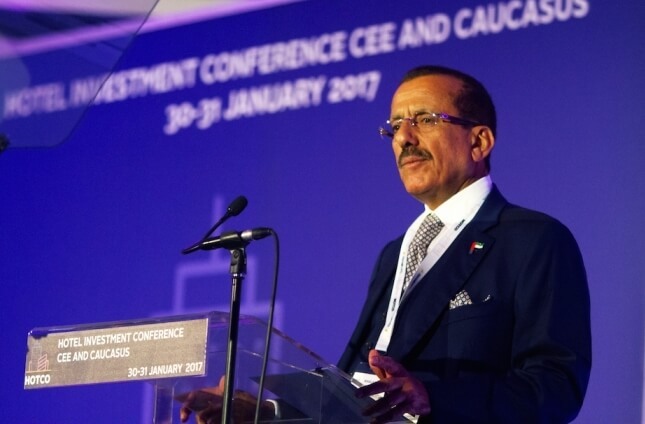 The UAE and Hungary have signed economic and trade agreements, and are cooperating in several fields including energy, agriculture and transport. Business is strong between our nations, and we are witnessing more Hungarians doing business in the UAE each year. There is a lot of cooperation between our nations, and businessmen and businesswomen are capitalizing on this. Trade between our nations is also on the rise – with an estimated worth of 700 million US dollars annually. The United Arab Emirates is the land of opportunity. It is the safe haven of the world, not just the Middle East. And I urge anyone who has not visited my country to come and see it with their own eyes. Take Dubai for example, my home town and the headquarters of my business. Today, I have seven hotels in the city. That is because I believe in the Dubai story. The United Arab Emirates has achieved so much in such a short period of time thanks to our visionary leaders. Our country is young in age, but old in experience. I could go on for hours talking about the potential that Dubai and the United Arab Emirates in general have to offer. I find myself doing the same when I discuss Budapest. I first visited Budapest because of my love for tennis. I felt at home, and welcomed by the wonderful people of Hungary. BUT, I have invested my money in this capital not because of the scenery, but because I believe Budapest has evolved into a modern city that today can set an example to the rest of the world.